The best-loved cult album of 2010 is a real comfort-food beauty. 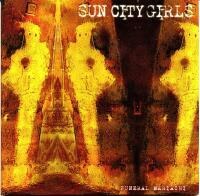 By at least one metric, the Sun City Girls’ final release was the best-loved cult album of 2010. Though it placed an impressive number 70 out of 1,839 on the Village Voice’s Pazz & Jop critics’ poll, its supporters voted for few of the poll’s actual winners, situating the Girls far from the mainstream of critical opinion. Funeral Mariachi also appeared in PopMatters’ own Slipped Discs feature, and it’s easy to like, even if it contains nary a trace of mariachi music--the title tune’s trumpet sounds more like Jon Hassell’s ambient work. Instead, the Girls envelop listeners in a logy haze halfway between Ennio Morricone’s western soundtracks and the Beatles’ “Sun King”. The opener, “Ben’s Radio”, butts an invented language collage against a deep, rolling-on-the-plains groove, complete with scorching guitar solo. “The Imam” is a sprightly Middle Eastern ode to cinnamon, complete with duck call. After that, things slow down. Several songs feature the woozy moans of avant-soprano Jessika Kenney, and the lead instrument throughout seems to be the basses. Beautifully recorded so that every instrument signifies, with piano and Mellotron popping out of the mix, Funeral Mariachi swaddles you in epic grooves and melodies.